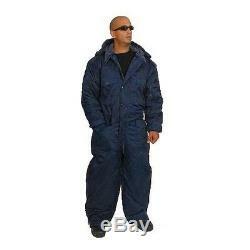 Cold Weather Hermonit Winter Gear Coverall water proof XL. IDF Cold weather garment also known as the "Hermonit" is made in Israel by Hagor Industries. Provides effective protection against wind, snow, and frost. Features two side zippers which extend the entire length of the garment. Synthetic fur lines the collar and hood. The warmest garment available in the IDF, protecting against the coldest possible conditions in Israel. Covers the entire body and is very comfortable. Outer layer made of 100% Nylon and is water resistant. Insulation made of hollow fibers. Hagor Industries was founded in 1956. Hagor is a major supplier of military gear to Israel Defense Forces, Israel Police, Special Anti-Terror Units in Israel and world wide. Hagor has been manufacturing a large variety of items connected with Soldiers personal gear for more than 50 years. If you want to return the item for the following reasons. Photo of the item is required, and the item must be NEW, IN BOX (if came in one) and NOT USED. If the claim is found just, we offer 2 options. All return claims must be made known within 14 days after item was arrived. The item "IDF Israel Navy Blue Cold Weather Hermonit Winter Gear Coverall waterproof new" is in sale since Friday, September 29, 2017. This item is in the category "Clothing, Shoes & Accessories\Men's Clothing\Coats & Jackets". The seller is "cohentsemach" and is located in Israel. This item can be shipped worldwide.